It was 6:30 on Tuesday, Apr. 3rd when I heard Bill getting up but he soon returned to bed. With the pitter patter of rain on the roof, it was indeed soothing enough to fall back to sleep but I was by 6:45, fully awake and got up. It was a warmer night so we didn’t have to unhook the water hose from the park tap last night. We were instructed to do that if temperatures dropped below freezing. I think it got down to 39F. The rain may not let up all day, but even though not as pleasant to look at, we prefer this much more than yesterday’s white blanket. I came downstairs and read my daughter’s latest post. My, that girl can write. You can check it out here if you choose. I only opened a couple of our window shades at first, since it is so dull out, there is not real light coming in. I prepped our drinks and turned the Keurig on before sitting in my chair with my book. This one is 3rd Target by James Patterson and of course, another page turner. Bill was up at 8 and we had our hot drinks together. It was my turn to shower so we turned the furnace on for about 20 minutes to warm up the bathroom a little more. We do that because we can! 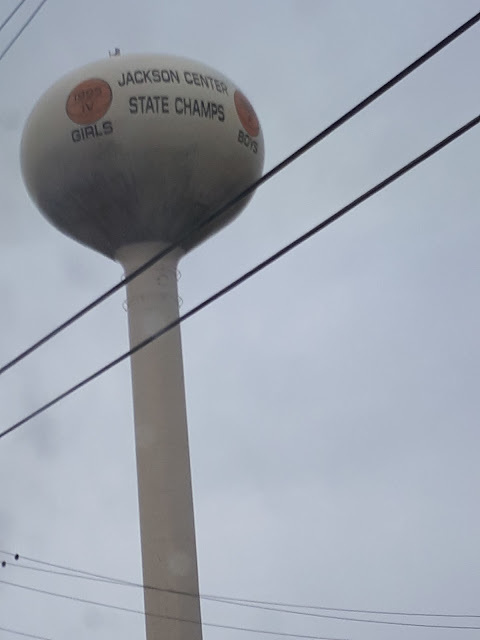 It is supposed to warm up to 65F today, in the pretty steady rain, but so far at 11:30 it is still hovering around 44F. I doubt they are going to be correct today, but I’ve been wrong before. This is kind of cool! 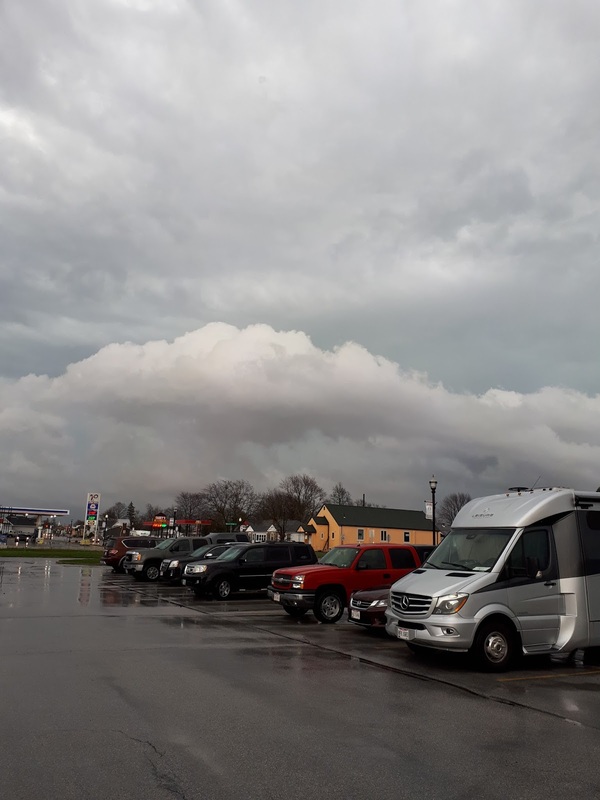 Within a few minutes of me writing that, we watched our friends and fellow bloggers, George and Suzie, pull in with their motor home. They drove along the creek road and pulled into a nice spot, just the right size. It was raining crazy so instead of walking over, we hopped in the truck on our way out to brunch and stopped to say hello. We drove across the highway to Bob Evans. I’d never eaten here. We both ordered from the breakfast menu and I was not to be disappointed. I ordered an omelette with hash browns and a Mexican-style meat salsa on top. I asked them to hold the jalapenos and they did. With sour dough toast on the side, I dove right in, almost forgetting to take a picture. We each had tea with creamer and left with very full tummies. I had a quarter piece of the toast and left the rest on my plate. 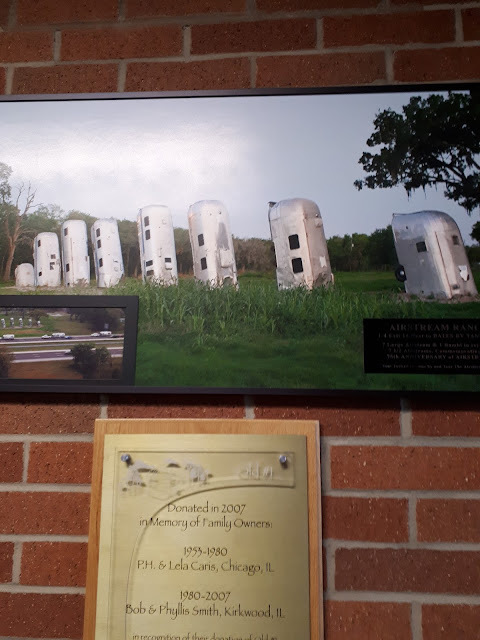 From there we drove to the Airstream Factory on W. Pike Road. Don was the older gentleman who greeted the 20 of us and took us on the tour of both buildings. This was an interesting tour although it didn’t tell us anything new, really. 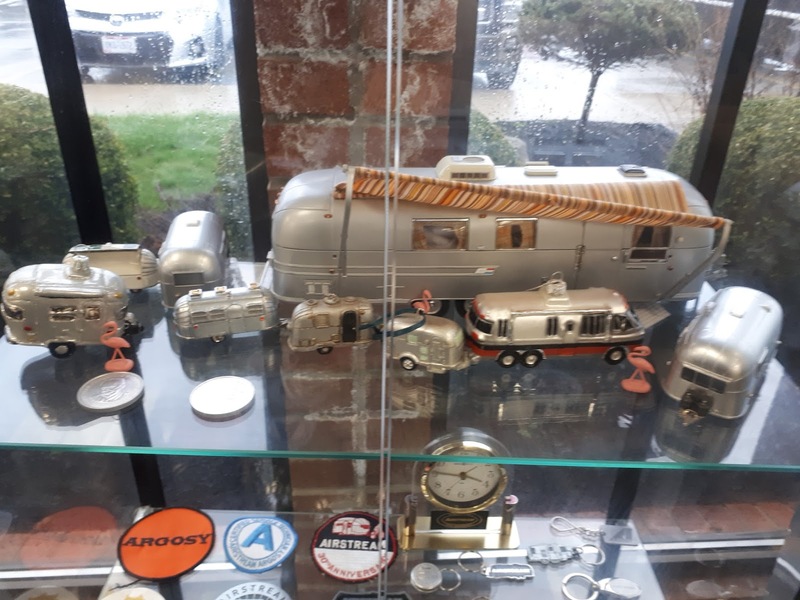 We already know the quality of the Airstream is top notch, just like our Mobile Suite but we enjoyed the tour all the same. We even got a sneak peak at their newest model, the Nest but we weren’t allowed to take pictures inside the factory. 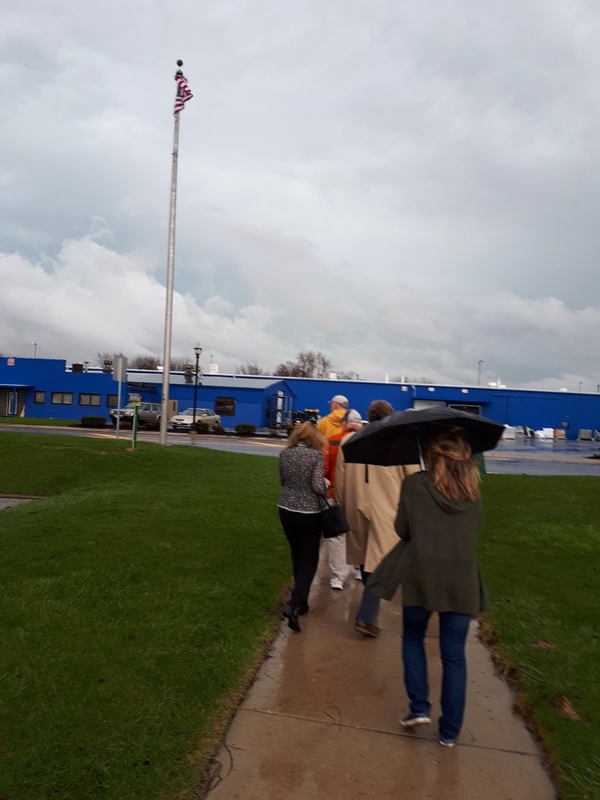 During the 2 ½ hours of our tour, there was quite a thunderstorm. Constant rain and periodic thunder and lightning kept us alert as we all ran across the parking lot. We thanked Don for his guided tour and headed home. George and Suzie were outside filling their water tank so we walked over to welcome them properly. We agreed to get together at our place for a late Happy Hour. We had a nice visit catching up on a few things, back and forth. Always enjoyable to see them again. When they left shortly after 6 I took a walk down to the recycle bin with some plastics and walked back along the creek. Keep your children and pets away! I am stunned at how much it has risen in today’s rain and how fast it is moving. it really is quite warm out there now and we are resting at 61F at 7:15. Neither one of us is too hungry, which is crazy but I figure soup or a sandwich (in Bill’s case) will fit the bill. This was a good day, no, a great day! I hope yours was as well. Seeing firsthand the quality of the Airstreams lets one understand why their cost is justified. So good that they are still being manufactured in the USA. I wonder when this awful weather is going to let up. Good that it doesn't bother you. Keep your spirit and try to have fun. That is correct about the Airstream. They are a forever trailer if you want to go that route. Wasn't that something about George and Suzie's wake up this morning!! OMG yes! How crappy that it happened when they were so close to home too after a safe trip. Well, there really isn't a good time. At least insurance coverage is good and will take care of it. 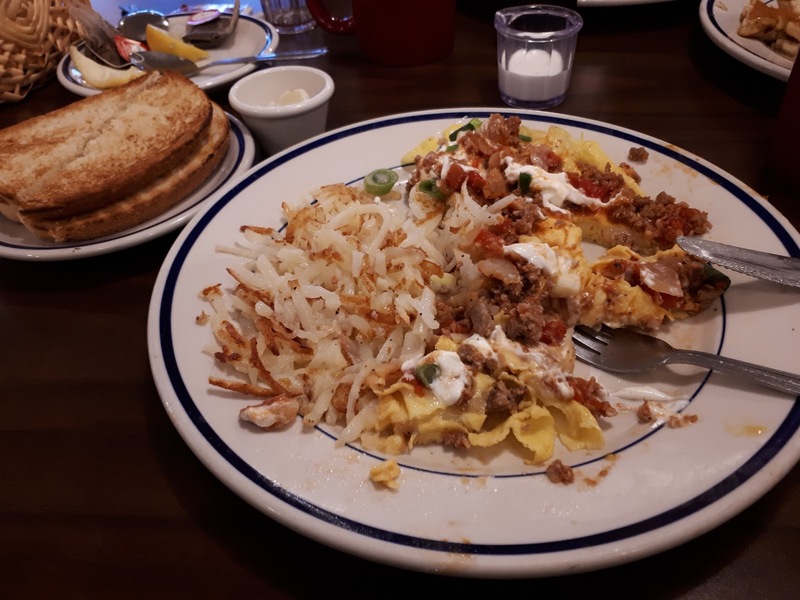 Your brunch looked awesome..I love Bob Evans when I go East. 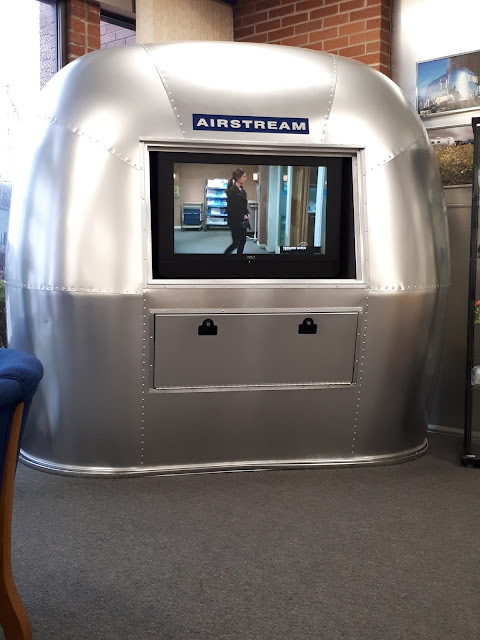 Great day at Airstream, they are beautiful! You're getting lots of rain, but you know it will soon be summer on the Ridge! Glad you got another happy hour or two with George and Suzie! Good food, a good tour and then another great visit with friends. I'm sure it won't be long and the temps will be decent at home. Fingers crossed! Glad you got to see first hand how they build these amazing trailer, And the weather did finally warm up only cool back down again. But like you we are on higher ground mostly. The tour was great, it only confirmed what we already knew but that is good. The weather warmed up after 7, how weird. The wind today will dry things up from all the rain. You did manage to send some of the white stuff our way sis! The ground has a skiff and I believe they are calling for it off and on the rest of the week. Hmmm camping in the rain....I remember those days only it was in a tent! Hopefully it dries up before you have to pull out. Sorry about the snow, but still hoping it will be gone by the time we return to the Ridge especially. Camping in the rain, yeuch! Glad we are on higher ground and can step out onto gravel. The river is rising momma!! I hope you are able to stay high and dry!! I too have never eaten at Bob Evans. The food looked delicious!! Glad you are finding interesting things to occupy your time. Might be wise to stay a while longer. Forecasts showing us above 50 F in another week.